With Assassin's Creed II's entirely different era, location, and protagonist than the original, it seemed like the franchise was destined to face radical shifts with each new installment. Its fiction lent itself nicely to the idea, with Desmond anchoring the core story in 2012 while the player darted across rooftops as his stealthy ancestors. Despite this, Assassin's Creed: Brotherhood will directly continue Ezio's story as it left off in II. Unlike the last game, however, Ezio won't be alone. Ubisoft isn't about to abandon the series' core elements of stealth, acrobatics, and combat, however. You'll still be dispatching oblivious guards with an assortment of gadgets and blades, but you'll also use your newfound infamy to inspire others within the city. As a master assassin, you have the ability to inspire "rebels without a cause" and give them a sense of purpose. These proteges will make up your guild of assassins, and can be deployed as you see fit. Specifics regarding how these mechanics will play out are sparse, but it promises to be one of the most significant gameplay enhancements in Brotherhood. 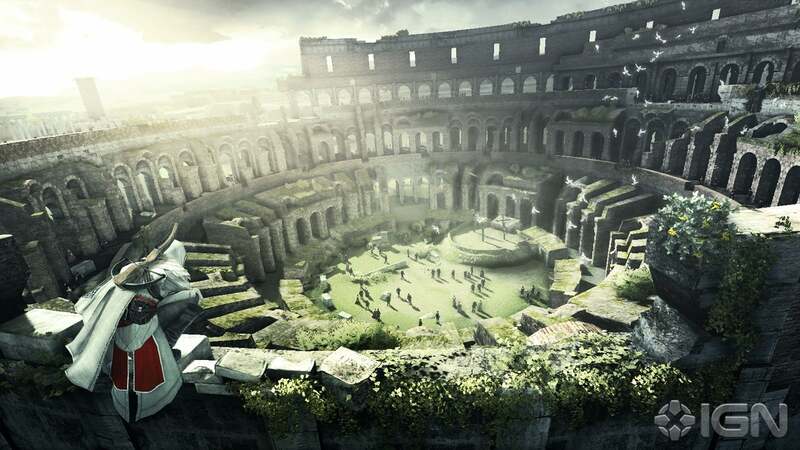 Rome was the original city of choice for Assassin's Creed II, but was deemed too large. Research of Italy's capital started back in 2008, giving the team a head start when it came time to start on Brotherhood. Ubisoft promises that Rome will be three times the size of II's Florence, and a huge part of the game revolves around restoring the crumbling city. Details are sparse, but it wouldn't be surprising to see the return of II's villa restoration elements. Brotherhood will break from series tradition in one major way, as it introduces a full multiplayer mode. Ezio and Altair always focused more on attacking from the shadows than with head-on force, and the multiplayer will reflect that. Rather than standard deathmatches, Brotherhood gives specific kill orders to players of eight different character types. At the beginning of each round, the only information you're given is the type of character you're looking for and a radar to guide you to the general vicinity. Onscreen indicators don't tip you off as to whether that priest you're looking at is an innocent AI or your human target, so you have to utilize a keen eye to spot unusual behavior. If your target is a careful player, he'll blend in with the crowd so as not to arouse suspicion. If he's impatient and darts towards his destination, he's far more likely to be the recipient of a throwing knife to the skull. Each character type can utilize unique abilities to aid them in their escape. One character can cause all NPCs in an area to resemble himself, while another can send a decoy NPC bolting in an effort to draw the killer's attention. Like many modern competitive multiplayer games, Brotherhood will reward you with perks as you progress. They won't all involve NPC actions like the prior examples, as others are more persistent attributes like quicker speed or quieter footsteps. You'll need any edge you can get, as you'll have someone hot on your trail the entire time you're stalking your own prey. With new single player features and a brand-new multiplayer experience that draws on the series' best elements, Brotherhood should definitely be on the radar for fans of the hit stealth series. The Renaissance is when war started to change. It’s when we start to see mercenaries and professional soldiers for hire appear throughout Europe and especially in Italy. Different city-states in Italy hired them, and even the Vatican got into it in by the end of the 15th century. In that context, the weapon of choice remained the sword, but the soldiers started to use pikes and firearms more frequently because they were more efficient. We tried to depict that in Assassin’s Creed Brotherhood. For one, you’ll see more Seekers in Rome. They’re the ones carrying the long weapons (pikes, halberds, etc). Remember the mercenaries you could hire in Assassin’s Creed 2? Well, they’re back. However, the Borgias, and therefore the Papal state, also hired some help: The Swiss Guards. These guys were the most fearsome mercenaries of their time and they are in the game. They can use matchlock firearms in one hand with a sword in the other hand, making them deadly opponents. They protect areas of high interest for the Borgias, so watch out for them in places like Castello St-Angelo. The Borgias have also given some new equipment to their archers, such as arquebuses, an early muzzle-loaded firearm. Ezio also gets some major upgrades. We chose these weapons because they were either fan-favorites or additions that just made sense in our game. The integration of ranged weapons inside the fight system also shows that we are trying to reflect the greater availability of firearms during this era. - The Crossbow: I think this was something fans wanted for a long time. In the first trailer for Assassin’s Creed, Altair was shown with a crossbow and we never had time to implement it properly. Well it’s now in the game! The crossbow is really useful for dispatching enemies that are far away, without attracting too much attention. We also implemented a new “upper-body” animation system that allows the player to aim with crossbow, while being able to move Ezio at the same time. You can also use the Crossbow in fights, but it’s a bit harder to avoid being hit by enemies when you use it. - Heavy Weapons: Heavy weapons were around in Assassin’s Creed 2, but the player wasn’t allowed to carry one around. Well we decided to fix that, and give the ability for the players to buy and equip heavy weapons. There are now 6 new heavy weapons in the game, and that includes axes. What’s even better is that there’s a new attack in which you can throw heavy weapon, it’s useful for dispatching of enemies that try to run away. - Dagger of Brutus: This is a legendary weapon in our game. I won’t tell you how to get it, but I can tell you what it does. It’s the dagger used by Marcus Junius Brutus to kill Julius Caesar. So quite understandably, once Ezio gains possession of that famed weapon, any Roman citizen will be quite freaked out to see it in action. Enemies will flee faster if you use that special weapon, so it gives a different twist to the fight once you have it. - Dual Wielding: Ok I agree this isn’t exactly a new weapon, but there is a new way to use weapons. Ezio can now wield a sword or a blunt weapon and use the gun in his hidden blade at the same time. Same thing when he uses a small weapon, like a dagger – he can throw knives. What it does is that it allows Ezio to do new moves in fights such as gun counter kills or dagger and knives executions. It also means that the gun and the throwing knives are now fully integrated into the fight system. We’ll address the dual wield system in a later entry! These new weapons really change the way you fight and create a new style of play. We hope you enjoy them! In Assassin’s Creed Brotherhood we wanted to create new gadgets that were helpful to the player, or improve upon ones we’ve already used. Gadgets in the game are used to “spice” up some of our core mechanics. That’s why when we create a gadget it must be related to one of the main three gameplay pillars: social stealth, fight, and free running. For example, in Assassin’s Creed 2, the poison blade was clearly related to social stealth – it created larger diversion and drew a crowd. The smoke bombs were useful to get out of tricky situations in fights, and so on. - The poison darts: They are an improvement over the poison blade – they allow you to poison enemies without having to get close. It’s actually quite useful to create diversion, while keeping away from your target. Leonardo will offer to build this for Ezio. - Fast poison: Fast poison makes enemies go directly into berserk mode. This is a more precise way to create a diversion, because you don’t have to wait a few seconds before the poisoned NPC starts slashing wildly around him. Doctors will sell these upgrades. - Heavy sheath: The sheath allows you to buy and equip heavy weapons as your standard weapon. This is a super cool gadget to have, because it opens up Ezio to 6 new weapons. But, if you’re carrying a heavy weapon you cannot carry a one-handed weapon at the same time. This gadget can be bought in a tailor shop. - The parachute: This helps the player to better control his fall and allows for some cool new moves. You can even do an air assassination from the parachute (and it’s GREAT!!!). Leonardo will give you the parachute in the game. A few extra words on the parachute: while it may seem weird for Ezio to use a parachute, it is based on one of Leonardo’s drawings. While not being 100% historically accurate, the parachute had so much potential, we decided to keep it anyway. It’s really cool to climb one of Rome’s taller buildings and glide down toward the ground. It also opens up additional strategies such as gliding over guard posts, air assassinating from unexpected places, and more. Of course, old favorites are still in the game: the smoke bomb will be back, as are the dual hidden blades, the hidden gun, the poison blade, and so on. Work on the fight system for Assassin’s Creed Brotherhood really started back in January, just when the team was putting the last touches on the Assassin’s Creed 2 DLCs. We sat down together and looked at the various comments and reviews out there. We also had a list of things we wanted to fix (we all had our personal pet peeves). So our goal for the fight system was two-fold: make it faster, and make it more active. We wanted the player to take the offensive, and we wanted fights to become fast and deadly. That’s when we came up with the “Strike First, Strike Fast” tagline. Everything we did was to reward players for taking offensive actions. The fight pacing: Rather than use upbeats and downbeats, we decided to give a pacing to fights. Enemies will attack you continuously, at a standard pace. Therefore, you can be interrupted when you do an attack, or a counter-kill or a counter-disarm. This really makes it harder to rely on solely on defensive maneuvers and removes the staring matches. It also makes the fights much more intense because attacks can come in at any time. For example, an enemy attacks you. You launch a counter-kill, but another enemy will launch an attack while you are doing the first counter-kill! Well now you can interrupt that first counter-kill, and launch another one right after it to stop the latest attacker! The executions: This might be the most “spectacular” change we made. Once you do a successful execution, you can start linking them together. Ezio starts moving around, killing enemies with special execution moves. You just have to push the left-stick toward your intended target, and then push the attack button. Be cautious however, enemies can still attack when you link executions, and any hit will stop you! These two mechanics combine to raise the overall pace of the fights. It really is spectacular, especially if you wipe out a patrol in a few seconds, rather than a few minutes! Here are some extra details on a few improvements we made for the game. As mentioned in previous entries, listening to feedback from players is really important for us and we always strive to make the fight system better. Special Attacks: One thing we noticed in Assassin’s Creed 2 is that the special attacks were not used very frequently by players. They were useful, but often resulted in blinding or stunning enemies rather than killing them. They were also very hard to pull off because their charge time was too long. So, for Assassin’s Creed Brotherhood, we had one rule: Special attacks must always kill. That’s how we came up with the new special attacks for swords, daggers, long weapons, heavy weapons, and so on. - Daggers Special Attack: This allows you to throw 3 throwing knives at the same time. Really powerful, but it also means you have to fight with a dagger. - Sword: You can aim and shoot with the gun. It’s really useful against enemies that are harder to hit, such as agiles and Swiss Guards. - Heavy Weapons: You can throw a heavy weapon toward an enemy. It’s really devastating!! - Long Weapons: You can do a 360 Sweep. Ezio swings the pike/halberd around, slicing the throat of all the opponents around him. It’s a really powerful special attack, but it also means you have to get your hands on a long weapon first! - Gun counter-kills: When Ezio dual wields a sword and a gun, and launches a counter-kill, he will sometime use his gun in the counter-kill. For example, Ezio blocks the incoming hit with his sword, kicks the enemy in the stomach, and while the enemy leans forward in pain, Ezio shoots him in the head. - Dual wield executions: These are the flashiest, most impressive moves Ezio can do. You can perform them after doing at least one execution. With the sword or dagger equipped, hold the attack button rather than just tapping it. This will launch a dual wield execution. With the gun, it makes Ezio kill an enemy with a sword, while killing another one with his gun on the other side. However, my favorite is one of the dagger/knives executions. Ezio slashes his dagger on the first enemy, turns around and throws a knife at another enemy, and then returns toward the first enemy to finish him. All these improvements were made to make the fighting system evolve from being passive, where the players where basically waiting for enemies to do their first move, to become active. For us, it’s essential that the fight feels more deadly and fast, and has a good enough mix of old and new mechanics to still feel like the fight from an Assassins’ Creed game. A lot of fans were requesting a multiplayer mode in our forums and on our fan pages, and were sharing crazy ideas about it after the release of the first Assassin’s Creed. As you may have noticed with Assassin’s Creed 2, we pay a lot of attention to gamers, and we continuously aim to please them, and at the same time surprise them with features they weren’t even expecting. In Annecy, our studio has specialized in multiplayer gaming since we created the critically acclaimed Splinter Cell versus modes back in 2004. It is because of this expertise that in 2008 we were asked to build some multiplayer prototypes based on the Assassin’s Creed universe. The original idea was inspired from a live RPG called Killer and the Highlander movie killer loop. Every participant of the loop has to assassinate a designated participant, while being also the target of another. From that initial idea, we then worked to integrate the core game-play element of the Assassin’s Creed games such as the assassinations, the social stealth, and the free running. We had the chance to spend a complete year building various prototypes. Our objective was very clear: the multiplayer experience had to be innovative, fun and respectful to the Assassin’s Creed universe. If one of those objectives was not met, the multiplayer would not have seen the light of the day. During this prototyping phase, we explored a lot of ingredients. To name a few: the integration of sword fights, the interactions with guards and some more free-running-based objectives. None of those tries were satisfying enough, sometimes for technical reasons, other times for not being fun enough. It took us about a year to have the game engine ready for multiplayer experiments and to validate the core game-play mechanisms. 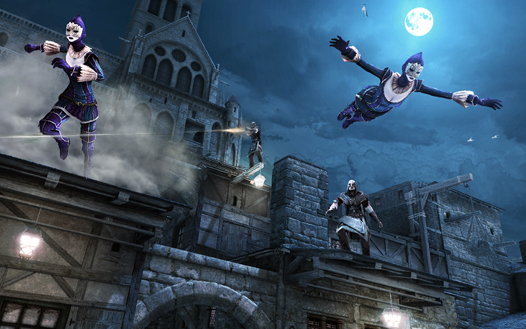 Various game modes were developed at that time, but the focus was to find the right mix between stealth and action. The biggest challenge was the social stealth aspect, because in order to allow players to blend in the crowd, we had to replicate on each console not only the players, but also over 100 non-player characters. Once we got the right mix and pace and that we were satisfied with the player experience, we developed mainly on two game modes: Wanted and Alliance. The Wanted mode is a re-interpretation of free for all death matches. Eight players have to assassinate assigned targets and score the highest possible points in a 10-minute match. What’s unusual for this type of match is that we set up the interactions between players by assigning them contracts. This way, at a given time, you have to focus your attention on a particular player (your target), and at the same time, you also have to watch out for all the other players, as they might have been received you as a target. The Alliance mode is a sort of cooperative deathmatch mode in which six players are grouped by two and have common targets to assassinate. Each one of the three teams has a four-minute round to kill the assigned team and make the highest possible score. In the second of the two rounds, the target distribution is inverted, so every team has to play with the others. For this game mode, we introduced cooperative actions like the possibility to mark the targets or the pursuers for your teammate and coordinated actions are rewarded by specific cooperative bonuses. In Assassin’s Creed Brotherhood multiplayer, it’s all about the quality of the assassination, not the quantity. A good player will kill his target either making a series of acrobatic actions or by being barely noticed by his victim. Overall, the player tactic is based on the mastery of the following game-play elements: social stealth, the fight and free-running. The fight can be easily divided into two separate actions: the assassination of targets and the defeat of pursuers. The assassination principle is simple: you just have to press one button to kill a target, but the possible combinations are endless: from hiding places, from rooftops, silently, without being spotted... and it’s the way you kill that will make the difference between players. Defeating pursuers also sometimes involve a counter attack, because the target has the possibility to stun his pursuer at anytime. But this defensive action only works if your pursuer has not yet spotted you, because in order to maintain the “cat and mouse” dynamic between the players, the kill has priority over the stun action. The free running is the third element playing a major role in the player’s tactics. Every bit of each map in the game has been enhanced to cope with the pace of the multiplayer game modes. Pursuits and escapes are triggered by revealing the target’s assassin when he or she fails to approach silently. To help the target escape his or her pursuer, the multiplayer maps contain interactive elements called Chase Breakers, which are triggered by the target as they’re being pursued. From our observations, we have noticed two main game-play styles: Players who are mastering the social stealth aspects and the players mastering the free-running. In both styles, the fight has to be mastered to achieve high scores. SAN FRANCISCO- November 24, 2010 – Ubisoft announced today that the Animus Project Update 1.0 downloadable content (DLC) for Assassin’s Creed® Brotherhood for the Xbox 360® video game and entertainment system from Microsoft and the PlayStation®3 computer entertainment system will be available for download on December 14th, 2010 on XBOX LIVE® and PlayStation®Network. The DLC will be made available for free. The Animus Project Update 1.0 will include a brand-new game mode and brand new map for Assassin’s Creed Brotherhood Multiplayer. The game mode, Advanced Alliance, will take the original Alliance Mode with target identification and engagement more difficult, thus providing a more challenging experience for players. With three teams of two players each, Advanced Alliance is a tougher test for players and rewards teams that use stealth techniques to hunt their targets. Located on a rocky tidal island of Normandy in France, the new map, Mont Saint-Michel, offers breathtaking scenery sure to enchant all. Its particular topography of narrow streets, high-perched bell tower and multi-leveled architecture is perfect for hunters to surge from out of nowhere to execute their prey. To survive, recruits will need to use free-running and narrow roads to their advantage. “We are very thrilled to be able to offer the first Multiplayer DLC for Assassin’s Creed Brotherhood for absolutely free,” said Sebastien Puel, executive producer, Ubisoft Montreal. “We wanted to say thank you to our fans for making Brotherhood such a huge success its opening week. We are very proud of the unique and innovative Multiplayer mode it offers, and hope the fans enjoy the new content.